A continental breakfast free Wi-Fi and rooms with mini-fridges and microwaves are offered at the non-smoking Seaway Inn located close to the beach. Pleasant decor furnishes the 28 non-smoking rooms at the two-story Seaway Inn. Rooms include free Wi-Fi and premium cable TV as well as coffeemakers mini-fridges and microwaves. Start the day with continental breakfast in front of the fireplace in the dining area. The hotel provides bicycle rentals and a 24-hour front desk. Parking is free and pets are allowed. 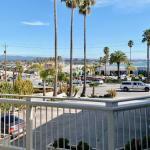 The hotel provides convenient access to Cabrillo Highway and is located on a hillside overlooking Monterey Bay. Downtown Santa Cruz is about a mile away. Santa Cruz Beach Boardwalk offers games food miniature golf and more and is within a half-mile. Work on your surfing skills at Steamer Lane one-and-a-half miles away. It's 35 miles to Norman Y. Mineta San Jose International Airport.